GETTING READY FOR a couple of solo Christmas shows, and I'm struck by how different they are from playing in The Cheeeburgers. On Saturday I'm playing at 4 p.m. for the Christkindle event in Washington Park. It's a great event and the weather will be great, so we hope a bunch of people come downtown. Please don't tell anybody this, but I actually organized my music the other day and put it into a semblance of order. I discovered a whole batch of Christmas music and will play a mix of instrumentals, originals and good old fashioned Christmas carols. I really like doing the solo thing, but boy do you have to pay attention and really focus on playing and singing at the same time. In the band there is more of a tendency to lock into a groove and just play. Plus since September we've been playing every weekend and that really helps get a band tight. I got a taste last night playing at Washington Perk's open mic night and I felt really rusty. A little practice this afternoon and hopefully it will go well tomorrow. Also playing Monday night for the State Street Bank Christmas party, which is more of an instrumental background thing but a fun gig nonetheless. No better way to get into the Christmas spirit than with music. Let's go! IT AIN'T EASY being the coolest cat in Quincy, you know. My silly human is gone and as you can see by the pic at right, I'm doing his blog today. He's such a ditz and he probably won't even notice. Plus it will be better than his usual dribble. Fast Eddie is my name, and chaos is my game. This morning my human ticked me off because the roof guy came to Second String Music and I managed to scamper upstairs. In case you didn't know, we are in the historic Dodd building at Fifth and Maine, and the four stories above us are vacant and filled with history. I love running around up there, catching mice and getting dirty. For some reason he and the roofer got all fired up and my owner used the treat bag trick to lure me back down, of all things. See if I purr for him any time soon. I love living in the music store. The more mayhem, the better. When we have our jam sessions, I like sitting under the front counter and soaking it all in. The other day a young boy named Jude came in and brought me a wind up mouse toy, and boy, was that fun to play with! My silly human thinks I'm a dog and likes it when I play fetch, as shown in the video above, but I only do it to placate him. My favorites are Lew and Lois, who come every Saturday morning to play with me. This morning my buddy Laura Sievert stopped by, she is always good for an ear scritch. She just needs to stop worrying about me shedding, and some day I hope to meet her three cats. I miss my adopted sister, Lucky, but I'm getting along just fine. I don't like spending the long nights alone, but I do like the Christmas lights and playing with the tree ornaments when my humans are gone. And of course I'm barking at them when they arrive each morning. I'm hungry, dag nabbit! 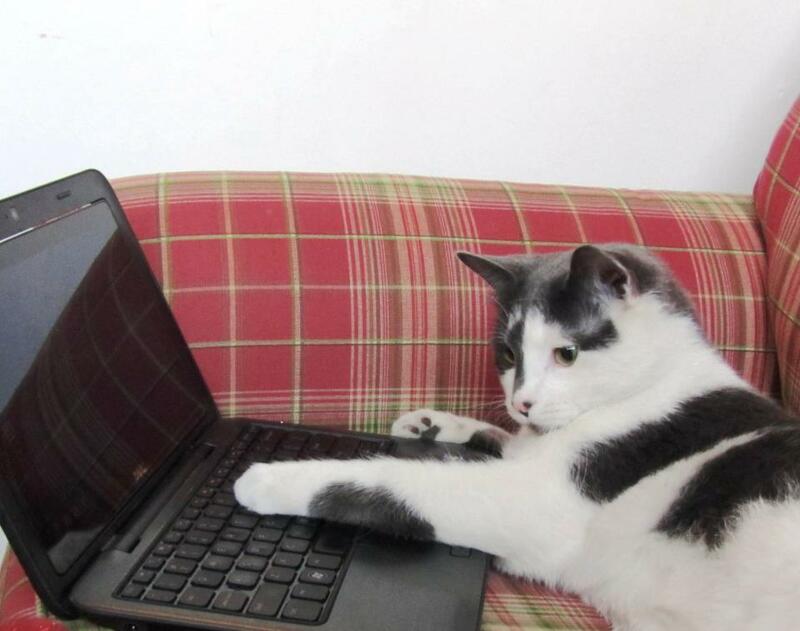 So, come and see me at Second String Music, but don't tell my silly human that I wrote this blog. He'll figure it out. Eventually. THE SUNDAY MORNING fog is a bit thicker right now. But I have an excuse. - Not sure what it is about the South Side Boat Club in Keokuk, but every time The Cheeseburgers play there we have an absolute blast. Last night somebody came up with the brilliant plan of celebrating a certain band member's birthday. The band member managed to hang on during the gig (he hopes) but it got a bit out of hand after that. You know it's bad when the drummer is the sober one on the ride home. GUH. - Our Cheeseburger Roadie of Doom, Frank Haxel, should get a medal of valor for putting up with us. Not only does he get us to and from the gig, he sets stuff up, tears it down and operates the lights. And buys a round of So Co to celebrate birthdays. - After getting home in the wee hours, I discovered my car wouldn't start (we all meet at the drummer's house to pile in one vehicle for the road trip). Leave it to Frank to come to the rescue again this morning, jumper cables in hand. We'll see if Old Blue turns over later. - Jeff VanKanegan is leaving the band at the end of the year, and we'll have much more on that later. We've recruited Don VanDyke to replace him on bass, and Don jumped in for a few songs last night. I'm really going to miss Jeff, but new blood is a good thing, and Don is a great fit for our band. - We are playing at a couple of really cool Christmas parties the next couple of weeks, then get ready for the huge New Year's Eve show. It will be Jeff's swan song and we are also fired up about playing with The Hipnecks, a killer band out of Columbia, Mo. 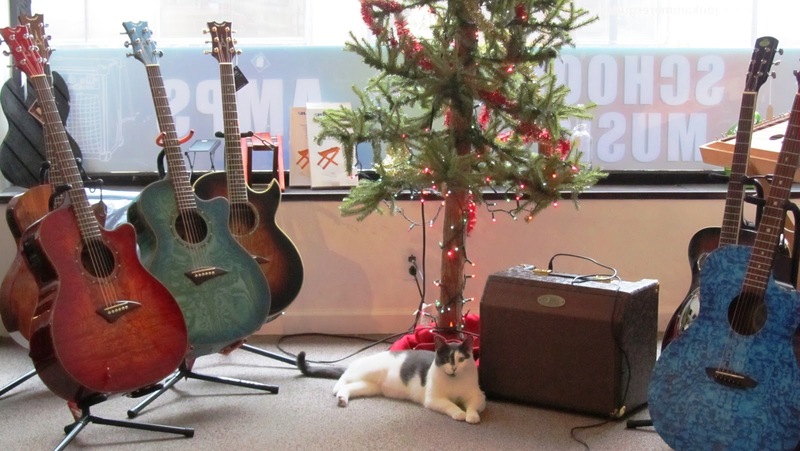 - We have extended store hours at Second String Music until Christmas and we'll be spending Sunday afternoons at Fifth and Maine. Wamma-lamma-jamma, too, so come on down and hang out. But don't play too loud until the fog clears a bit. AFTER A WHILE birthdays are no big deal. But I still like 'em. The only really significant part about today is that in two years, I'll be 50, which scares the living bleep out of me. And makes my siblings feel really old. Some people hate birthdays. Sheryl doesn't have one. She is ageless, actually. We celebrate her not having a birthday by being relieved that it is over. I'm going to mark the occasion by having lunch with Granny Annie Mays and selling stuff at Second String Music, and reminding myself to take my vitamins. I'm looking at Lucy, the Border Collie of Doom. She has her head down by her stuffed dog, which will soon be unstuffed, and this milestone business really doesn't faze her at all. "So you are old. Big deal. I'm just glad you managed to hobble around the cemetery this morning with us," she says. In the end, I am grateful to the Good Lord above for family and health. I am a day older and wiser. And I'm glad getting older means you don't grow up. WHEN YOU ARE in retail you try to do things differently. I would like to think Second String Music is unique, in many ways. For instance, I doubt any other retail establishment has a bank vault in the back, four haunted stories above the main floor, and a cat that eats Christmas trees. One of the things Sheryl and I learned early on is that you can only control what you do, not what others do. We take care of Fifth and Maine. And Fast Eddie when he is knocking over chairs and displays. Oh. Is there another retail outlet anywhere that has a birthday party with cupcakes for guitar students? TODAY WAS "SPECIAL Persons Day" at Adams School, and I was honored to be the special person of Andrew Baehr. Andrew's parents are Mike and Angie, and they are good friends and Second String Music customers. When I found out Andrew wanted me to be his Special Person, it melted my heart. Think about it. 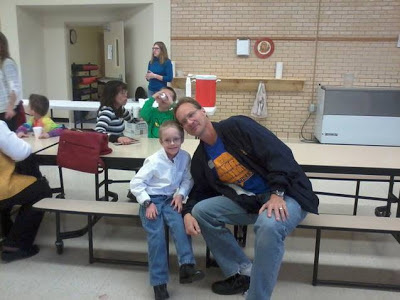 If you are asked by a first-grader to hang out in his class and he proudly introduces you as his friend to all his classmates, how much better can it get? Andrew is in Nicole Browning's class. She impressed the daylights out of me. She was friendly but in charge and you could tell by her ready smile and body language she loves her job. Quincy Public Schools is in good hands with teachers like Nicole. We played a turkey word game, went to the school book fair, had a cookie and drink in the cafeteria, and it was a fun experience. My daughter, Emily, went to Adams School and started in kindergarden in 1996 right after we moved here from Michigan. My memories of her at Adams are foggy, mainly because I was sports editor at The Herald-Whig and was usually in an 80-hour work week daze when we went to her activities. Gosh, the things we wish we could change. It might explain why I can't remember the names of her teachers, too. She did very well at Adams and then at Berrian for third grade. It was nice talking to Fred Cherny, Emily's teacher at Baldwin Elementary. He now works security at Adams and was very kind, remembered Emily well. I cannot say enough good things about Adams School and the entire experience. We hear nothing but negative comments about our schools these days and I am here to tell you the building at 20th and Jefferson rocks, and I was humbled to be part of today's event. As for Andrew, he rocks too, and I expect him to make frequent visits to Fifth and Maine so we can stay in touch. SO THE WHO are back on tour doing Quadrophenia, and I really want to go. They aren't sniffing anywhere around here - no St. Louis or Quad Cities shows. They canceled the Quad Cities show the last go-round, now that I think about it. The nearest show is in Chicago, five hours away, and it's tempting. Then again, do I want to sit in the nosebleeds for $50 pop, or pony up $150 for a floor seat? In the band's prime, The Who blew everybody away live. Not sure now that Pete and Roger are pushing 70 they will be as good, but the reviews from the early shows are good. I'm making excuses for not going, such as high ticket prices, the long drive up there, gas prices, missing from the store during a busy time, playing the next night with The Burgers, etc. Then again, this might be the last chance to see them. Of course we said that in 82 and 89. Guh. - The Cheeseburgers played at Adams Trading Post Saturday night, and after we got done, a guy told us "you done better than gooder." 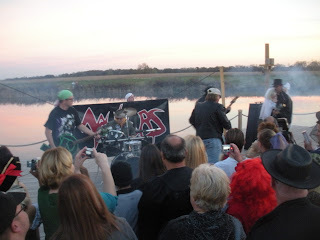 High praise indeed from a crowd that appreciates a live band, thanks! - Eric Clapton's Blues CD is playing in the store this morning, perfect way to get 'er going. - Our annual salute to good friend Pat Cornwell is Saturday in the store from noon until forever. We will toast Pat and LuckyCat Vegas about 3:30 pm. Just bring yourself and hang out with us, we'll have live music and general mayhem everywhere. - I know there is a method to the madness of being addicted to the guitar, but I am learning so much more with our teacher, Jim Bier. And it all makes sense. Imagine that. - Happiness is finding three different packages of strings in your gig bag after cleaning it out for the first time in months. Of course now I have to figure out which ones are missing. - Note to self: If I ever buy a guitar online, brag about it in a music store, then bring it in a few days later asking if the store will buy or consign it, shoot me. Now. - Had much fun walking through a filthy rain with some friends at Woodland Cemetery yesterday. I appreciate people who appreciate our history and discover Quincy's best-kept secret. Shhhhh. - I am on the Mary Griffith show Tuesday morning at 9:15 to plug Rock N Roll Shorts and the store. WTAD is 930 on the AM dial and you can listen online here. - Rock N Roll Shorts continues to sell well. If you are a Kindle Prime member, you get one free book to borrow per month and we are in the Kindle library. Read and rock on! - The big Veteran's Parade is this morning in downtown Quincy. Already people are braving the rain to line the sidewalks. If the rain clears, we'll set up on the sidewalk for more outdoor music fun. - Our new LTD guitars are getting a lot of attention. Almost as much attention as Fast Eddie's new Facebook site. - Great to have Jim Bier giving guitar lessons in the store on Saturday mornings. Hoping to sneak in a lesson myself with Jim later today. If you want to elevate your guitar game, Jim is your guy. - The Cheeseburgers continue to rock on with a show tonight at Adams Trading Post, always a fun place to play. We are actually off next weekend for the first time in what seems like forever, then start hitting the Christmas party season again. We've also lined up an awesome New Year's Eve gig at One Restaurant with our friends The Hipnecks. Tickets are available at the Sixth and Hampshire restaurant and will probably go fast. They will be selling dinner tickets but will also have non-dinner tickets available too. SO LAST WEEK Sheryl dispatched me to the thrift store just up the block to look at couches. We need one for the store, and I was tasked with taking a look. "They are upstairs and my knees are creaky. You go," she said. There were five or six fairly decent used couches in the price range. I looked at them all, saw one or two that looked okay, then took stock. Men really shouldn't make decisions about important things. Actually, there is no such thing as a big decision, so men technically are off the hook. I did what any good man would do. I deferred to my wife. Yesterday she went over there and picked one out. So I was ordered to go get it, along with the hapless Frank Haxel, who is always in the wrong place at the wrong time. We lugged it down Jail Alley and into the store, and my wife proclaimed it perfect. "What would have happened if you came back with this couch?" Frank asked. "I don't want to think about it," I said. So there you have it. 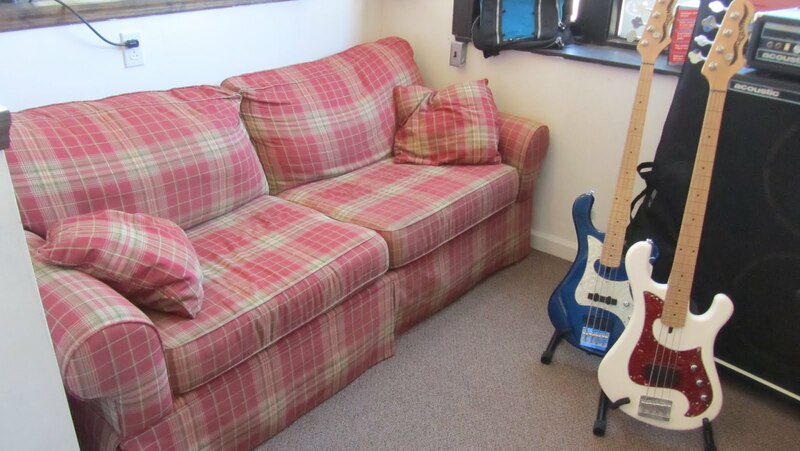 We have a new (used) couch at Second String Music. I might even take a nap on it this afternoon. I have decided it looks fabulous. SO IT TOOK a little bit, but Fast Eddie has adapted to being the lone feline inside Second String Music, and he's doing quiet well now, thank you. We've even started a Fast Eddie Facebook page. Hey, a business today can't rely on traditional advertising alone to get the word out. Fast Eddie's adopted sister, Lucky, has 2,300 Facebook friends, and we used her page a lot to spread the word about SSM events. Anyway, Fast Eddie is fast gaining new fans and admirers, both online and in the store. And the truth is, he thinks he's a dog. Don't believe us? The video below doesn't lie ... come see Eddie for yourself! SOMETIMES A GUITAR is far more than just a six-stringed instrument. It can be a connection to the past, a holder of treasured memories, a guide on the Magical Mystery Tour. I bought this really nice Epiphone Studio in early 2010 as a backup guitar and instantly fell in love. It has the classic thicker Gibson neck and I loved the low action and the way it felt in my hands, and the way it played. 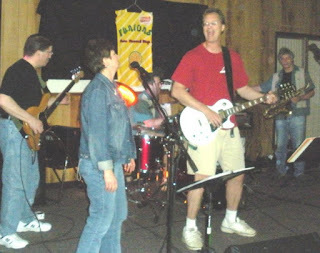 In March 2010, The Funions played a show at The Elks. A friend picked the guitar up by the strap and it fell to the ground, causing damage to the neck and body. It was an accident and I shrugged it off, but the guitar was unplayable and it was a downer. So I took it to my friend Scott Smith, who at that time owned Smith Music, and he performed one of his many miracles on guitars. He fixed the neck, sanded the surface down and spent a lot of time reviving it from the dead. Once again it played beautifully and there was something very cool about the guitar that I can't quite explain - it just felt right. 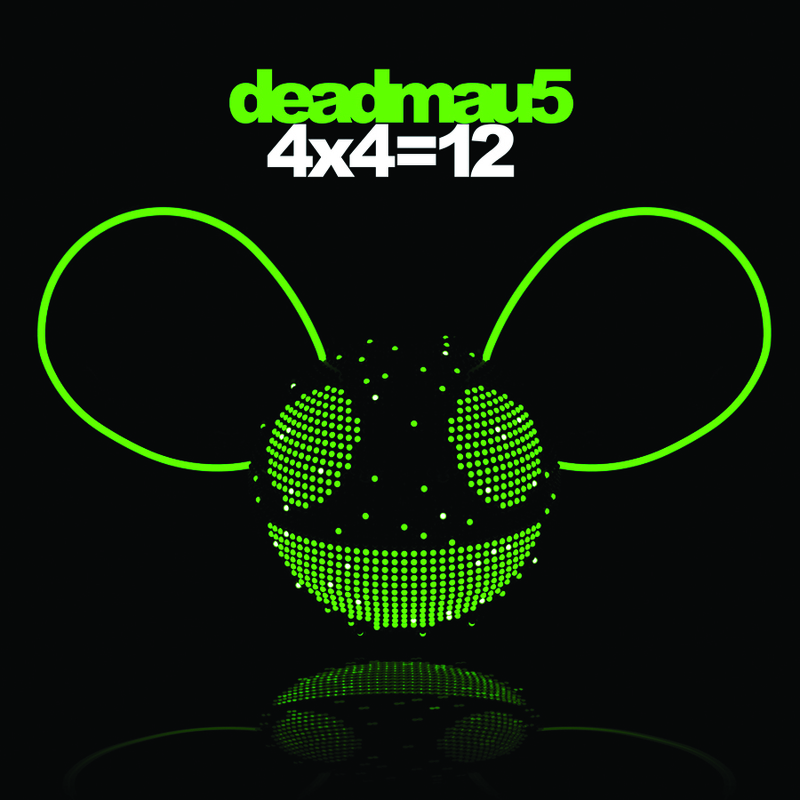 I played it at the last Funions show ever, in May 2010, and I also used it quite a bit when I hooked up with The Cheeseburgers. The Epi at a Funions show. Hi Marianne! 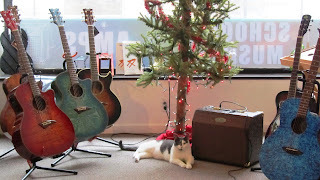 In February 2011, we opened Second String Music. I like to joke that we started with five guitars, and four of them were mine, but that's no lie. I reluctantly put the Epiphone on the floor, and sure enough, a friend bought it for his son. Last week, the guitar came back. I am assuming my friend's son no longer had interest in the guitar, because it hasn't been played a lot. So it's on the floor as a consignment item, and bringing back a flood of memories. I am reminded of my old friend, Mark Hoekstra, who says it's a "want versus need analysis." I don't need it, but I sure want it. Of course, you can say that about a lot of great guitars and stuff we have in the store. Thank goodness Sheryl is there to keep me straight and sane. Anyway, the Epi is back. If it goes to a new home, much more than six strings will again walk out the store. And I'm fine with that. THE WOODLAND CEMETERY tours last night were a huge success. Reportedly we turned away a boatload of people who didn't have tickets, and I got to take a group of Girl Scouts and their parents around the hallowed grounds. Young people who appreciate history are indeed special. William Richardson was a prominent Quincy politician and I learned an awful lot about him and his elections against Orville Browning. 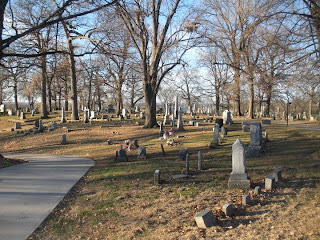 John Wood was also in the cemetery, and was Eliza Browning and others. They were all fantastic. I had no idea Orville Browning was a pallbearer at Lincoln's funeral. I knew he and Eliza were very close to the president, and the fact two of Lincoln's best friends are laid to rest in our midst is an amazing thing. Everything about the event was perfect, from the weather to the attention to detail. The only thing I'd try to do better is give more time to the tours - one hour isn't enough. Next year, I'd love to roam around the far south end by the mausoleum, because there are some fascinating characters at rest back there. If you are into history, and want to walk where those before us walked, come hang out. Lucy and Bella will be glad to take you on a tour if we are out for our daily walk! - I HEARD A rumor tonight's Woodland Cemetery tours have sold out. Really? I know it's the coolest thing to do in Quincy, and lots of people come, but maybe word has spread about what an awesome place Woodland is. Shhhh. 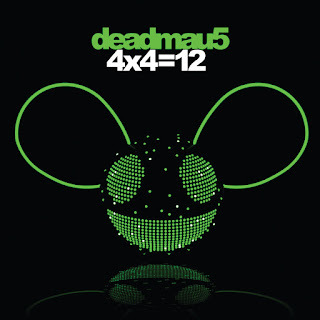 The girls and I prefer nobody knows about it. - I'm definitely out of practice when it comes to tucking the shirt in and being presentable. - It's another music mayhem weekend in the Q-Town. 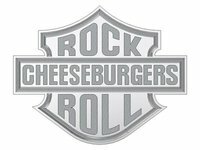 Tonight the Cheeseburgers set up for one of our favorite places to play, One Restaurant at Sixth and Hampshire. We play Friday night from 8:30 to 12:30, there's no cover charge and One has great food and drink specials. We usually have a big crowd and we will also be making a big announcement about New Year's Eve. - On Saturday night, I'm helping out with the Freddie Tieken event at the Holiday Inn, joined by fellow Cheeseburger Kirk Gribbler and legendary sax player and Funion Jack Inghram. The event benefits the Mendon school district and is the first time Fred has been back for a public performance in years. He's threatening to jam with the band after the dinner, too. 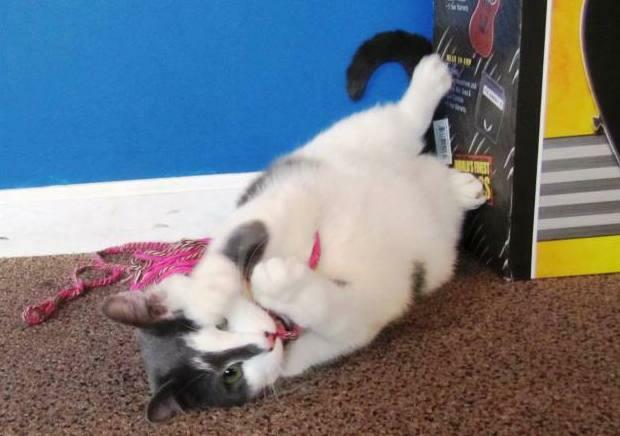 - Did you know our Second String Music cat, Fast Eddie, now has his own Facebook page? It's already going crazy. Fast Eddie is a social media kind of guy, so it makes sense. - And ... I really miss Lucky. I DID SOMETHING this morning I've never done before - I walked to work downtown. It's only a mile. It's a gorgeous fall day. I put my iPod in my pocket and earphones on, and it took about two seconds, or so it seemed. - I'm done with four chapters of my next book project. I walked right past Eighth and Washington. I looked up at the second floor windows of the old store. I swear I saw somebody move up there. - The sidewalks are clean and the walk is gently downhill from Seventh to State. But when I got to Seventh and State, I stopped. On the left is the big apartment where there was a fire a few years ago, and several people died. It was one of the bigger stories I covered, and I wonder how the families are doing. And I won't even think about the landlord. - The old church on the east side up by York is very cool. Boarded up and cold and lonely, but cool. - Did you know there is a downtown mall walkway from the alley behind The Maine Course? Other fire victims are honored on the plaque. - Amazing how the wind is about 20 mph stronger at Fifth and Maine. - It struck me as I was walking how I'd followed Hurricane Sandy without even touching the television set. As a reporter I was so surrounded by changes that it was hard to grasp sometimes, and yet there I was this morning, finding out everything on the very laptop I am typing with right now. - I don't miss DirecTV or cable. - I'm in such a good mood, I'm not even ticked off about the neighbor who let his dog out, and it ran into our backyard while Sheryl and were at Woodland with the girls, and it was pooping as we got home. Bella and Lucy weren't impressed. Neither are we with the owner. The dog? He was just doing what came naturally. Oh well. - I always smile when people come in to the store and ask if we have Taylor or Martin guitars, then turn right around when we politely say no. That's okay. 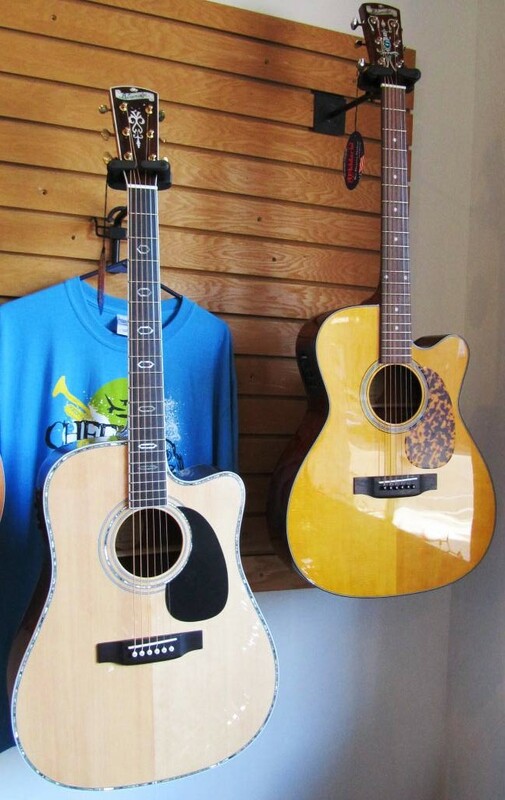 Careful though, cause if you play one of our gorgeous Blueridge guitars, you might be fooled. BTW, we do have an incredible 2008 Taylor 426CE LTD with a hard case in the store right now, so we'll see how long it lasts. - If I have time, I might just walk home! FRIDAY NIGHT IN Quincy, I am making my acting debut. Well ... not really. I'm not a doctor but I play one on TV, after all. Greg Ellery and friends have put together an event called "Evening of Wit and Wisdom." Basically it's just people reciting speeches from great moments in history. I thought about it for at least two seconds and came up with what I think is a great speech. I've memorized my lines and I'm ready to roll. Friday night at 7:30 or so, I will hit the stage, overcome the fright, and inspire people to not give up. You'll just have to be there to see it for yourself. WE JUST PULLED the plug on our DirecTV package. We did it for two reasons, to save money and to resist the urge to get mindless. I am the worst person in the world when it comes to crashing in front of the television. Worn out from a long day, I simply succumb and let the idiot box do all the work. There is a time and place for relaxing, but it's just not a good idea to be a blob every night. I will miss my ESPN, and finding a good game on television during bowl season. We did hook up an antenna and we get the local stations in HD, so there will be stuff to watch. Pretty much the only day we get to be bums is Sunday, and there's usually NFL games and golf to help us nap. This should also inspire me to write more. I realized last night I haven't had a guitar in the house for a long time, so it might be time to bring one home to bang around on instead of watching Red Dawn for the millionth time. There's also our DVD player. We might have to buy "A Christmas Story" so Emily Hart doesn't panic Christmas day. The TV shouldn't run our lives. It's more full of crap than good. It will take a little getting used to, but we'll be way better off for it. Where are all our old DVDs, anyway? GETTING READY TO start a new book project, and I'm finding out the book thing is a lot like the newspapers bidness. You work really hard on it and after it comes out you move right to the next project. Sheryl has me reading a couple of Kindle books and they are interesting. My next book will likely be about a place in Quincy, but I'm getting more and more intrigued about doing a fictional piece that will appeal to a wider audience. There is an incredible Quincy murder story more than 30 years old that has never been told, and it could very easily be written with the "based on a true story" angle. The main thing is to keep going, because self-motivation is often a struggle. So. Here we go, plunging headlong right into it. IF YOU WANT to see a Facebook post go viral, give somebody a hard time about using all caps to post a status update. My mother, God bless her soul, was an English teacher, and I have used the language to make a living for half of my years on this earth. So yes, I do get a bit perturbed when people type in all caps for no good reason, or deliberately sabotage spelling to take shortcuts. Text much lately? Right. My point exactly. A while back I made the mistake of poking fun at a gal on Facebook who uses all caps all the time. She claims it's because she can't see very well, and trying to tell her all caps is actually harder to read and all you have to do is hit the CTRL and + buttons to make the font bigger fell on her deaf keyboard. Then her friends and family came to her aid and pretty soon I was the Iron Sheik or some other bad guy. So I left the FB group, which is too bad because it's a local history page and very interesting. Oh well. I guess the main reason I don't like all caps is because it makes the writer appear like he or she is shouting, and things are just generally too loud in this world as it is. Don't shout it out, just tell me about it. Please? Tonight I got irritated at a Cardinals fan who wrote a stupid post in all caps. You know what? There are way more important things going on and bigger issues to get mad about. Like using too many exclamation points. Or the stupid commercial with the kid blowing on his tuba for a virtual audience. GUH. And I'm having a great Sunday with Sheryl, recovering from Saturday night's Cheeseburger rock and roll truck and enjoying Woodland walks with Bella and Lucy. So I'm feeling better about it. And there's no reason to shout it out in all caps. Labels: Capital letters, Facebook, silly Cardinal fans. IN MY PREVIOUS newsguy life, I dealt with a lot of PR people. Good ones were hard to find, to be honest. They'd send out garble and expect it to be printed word for word, if we could even discern what was in the release. I learned in a hurry who the good PR people were, like the awesome Tracy Orne at John Wood Community College and the Blessing Hospital folks back in the day. Our good friend Laura Sievert does PR for Kirlins and is quite good at it. She is suggesting I'm turning to the Dark Side of The Force, now that I'm the one selling and promoting. Laura is a self-professed Dark Sith Lord of Doom, and she will train me well. And turning to the Dark Side has advantages - the star destroyers are luxurious and you can make inanimate objects fly around, along with performing Jedi mind tricks. So now I'm on the Dark Side, promoting my book and trying to get a little media luv. I had a lot of fun with friends Greg Haubrich and Rich Cain on WGEM radio this morning, and it was just like old times - You Can't Make It Up! So ... here's the press release for Rock N Roll Shorts. I have no idea if it's any good. I'll let the media figure that one out. The stories have music as the theme and are based on true events. They range from a musician fired from his band to a church praise band gone awry. The digital book was published through www.smashwords.com and is available online at Amazon.com and on iTunes. The paperback version of Rock N Roll Shorts has two additional stories and is available for $6 at Second String Music and at Great Debate Books inside the Maine Center at Sixth and Maine. Hart is doing a book signing at Great Debate Books on Saturday, Oct. 27 from 10 a.m. to 1 p.m.
Hart retired from The Herald-Whig in August 2012 after 16 years at the paper and 24 years in the newspaper business. He and his wife, Sheryl, own Second String Music at Fifth and Maine in Quincy. 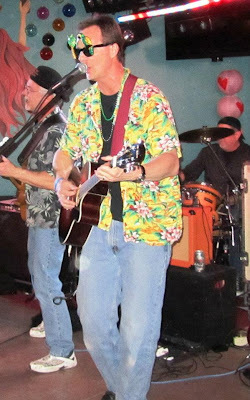 Hart plays guitar and sings in several area bands, including classic rock cover band The Cheeseburgers. For more information, contact Hart at (217) 430-1454 or rotkneehart@yahoo.com. His website is www.hartyrr.com.